Sorry for the few day lapse! I was afraid that would happen this week, being our first full week for quite a while!! Here is a quick card I used to get the mojo going this afternoon. I don't like to do things overly complex, who has the time?? This may resemble several of the Valentine cards I've done the last few weeks, because I started with the same DSP-Sending Love. The challenge this week from Connie & Julie is to use Real Red, Chocolate Chip & Pretty in Pink. The paper is those colors so it was a logical place to start. But, I didn't want to go valentine! Stamp set used is With All My Heart from the Occasions Mini. 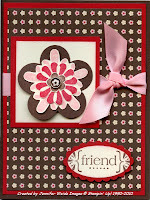 Card base is Chocolate Chip, layer of Real Red, and the background small flower print from the Sending Love paper pack. For the main image, a background of Real Red & Very Vanilla (edged with Pretty in Pink). The Extra Large Fancy Flower punch in Chocolate Chip is layered under my stacked elements. I stamped all 3 flower images from the set, one in each color. Cut around the edges and attach together with a Chocolate Chip Sending Love Epoxy Brad. The cut flowers are attached with mini glue dots to the punched flower, and the whole things is attached to the Vanilla with a jumbo glue dot. Attached over the new Pretty in Pink Satin ribbon. Finally, friend from the set was stamped on Vanilla in Chocolate Chip, punched with the large oval, sponged with Pretty in Pink and layered on a Real Red scallop punch. Now, off to create club cards for tomorrow! Love it! I haven't used that pattern except for little accent pieces but I love how you incorporated it in your design! I am not a glitter girl but I am loving this Sending Love DSP. I have been using it much more than I thought I would. I love the colors in it - well I love most things that include Chocolate. Great job with your card! Excellent job with the Create with Connie and Julie Challenge this week! That DSP is perfect for more than just Valentine's Day! Fabulous Card Jennifer! I love how you layered all the flowers!